image: a sketch of the proposed cenotaph 'in situ' with coloured flags, imagined as it would be during a remembrance ceremony with a crowd gathered before it. 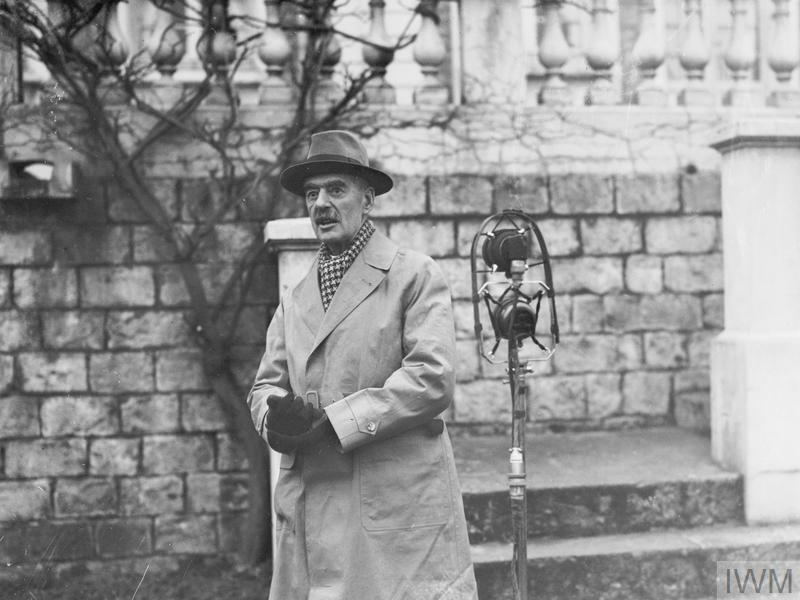 Lutyens was first approached informally by Sir Alfred Mond, First Commissioner of Works in Lloyd George’s government in June 1919, to design a monument to mark the signing of the Peace Treaty. 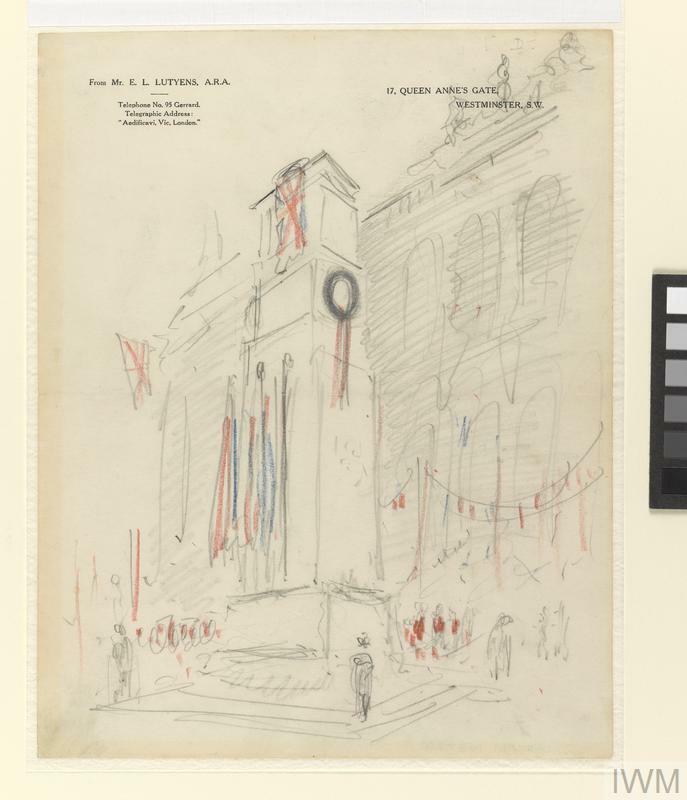 Following discussions with Clemenceau and the Peace Celebrations Committee, Lloyd George met Lutyens in early July 1919 and asked him to design a catafalque for Whitehall, to be part of the Peace Day events on 19th July. Lutyens’ alternative suggestion of a cenotaph was agreed. 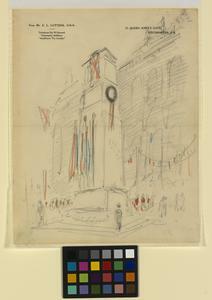 Later that day Lutyens presented drawings to Sir Frank Baines, based on his previous design for Mond. 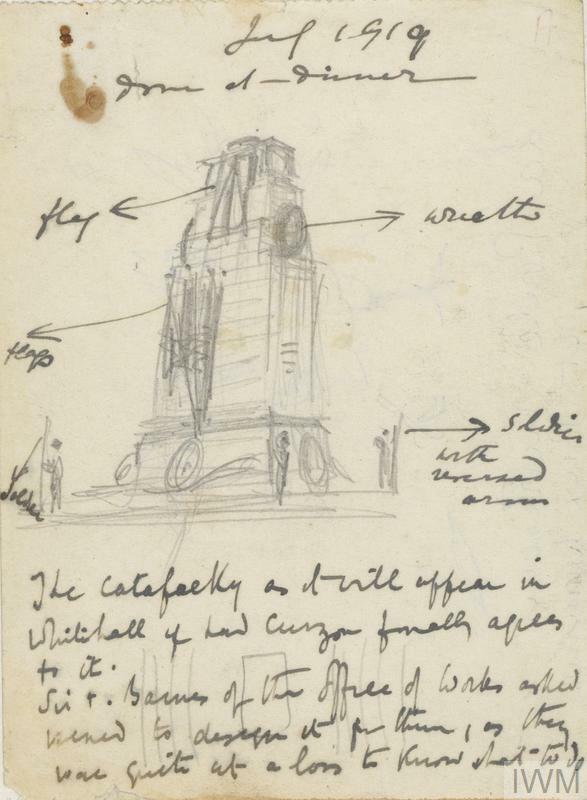 These sketches were drawn over dinner with Lady Sackville in the evening, and annotated by her. 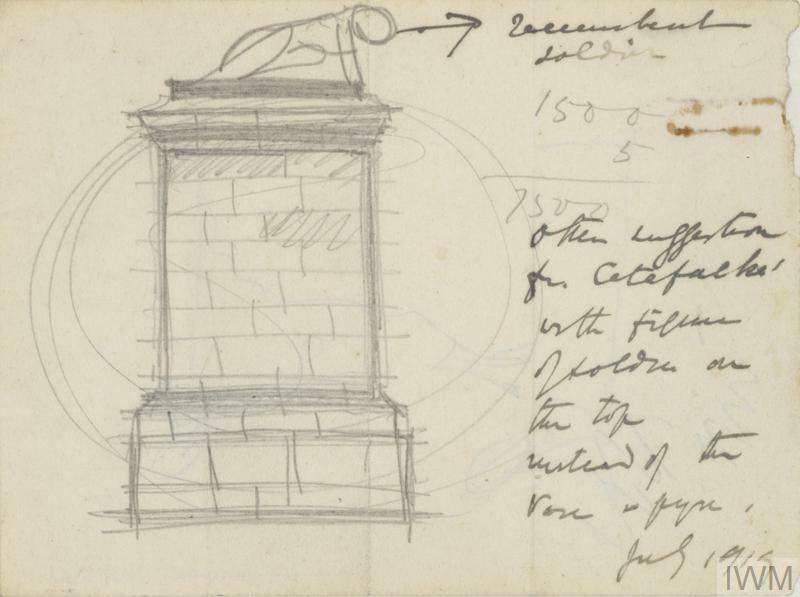 The final design was based on measurements of the Parthenon. In the classical manner, all the surfaces were subtly curved; the verticals would meet at a point 1000 feet above the ground and the horizontals, 900 feet to the side. 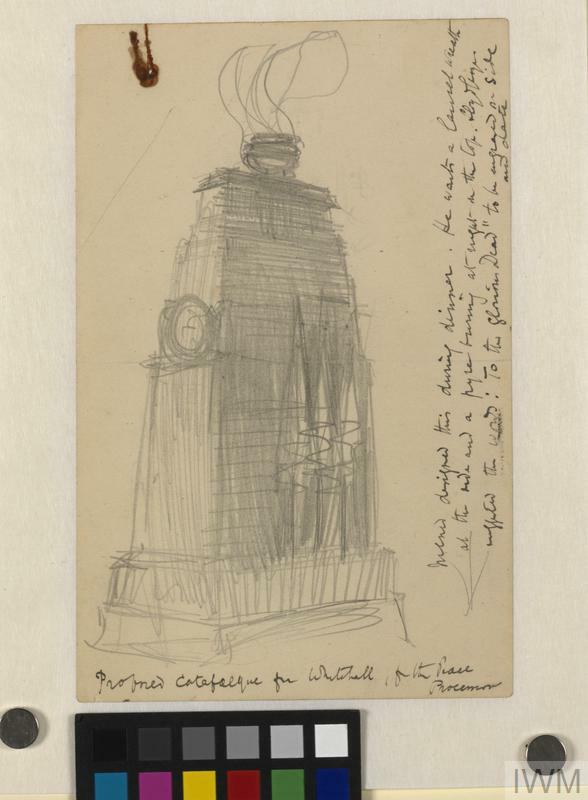 Stripped of all literal elements (at Lutyens' insistence four soldiers at the base were not included), the simplicity and dignity of the monument became the immediate focus for national grief. The wood and plaster structure was unveiled on 18th July and was originally intended to stand for a week. Its extraordinary popularity extended this to January 1920 when the weather finally forced its removal. 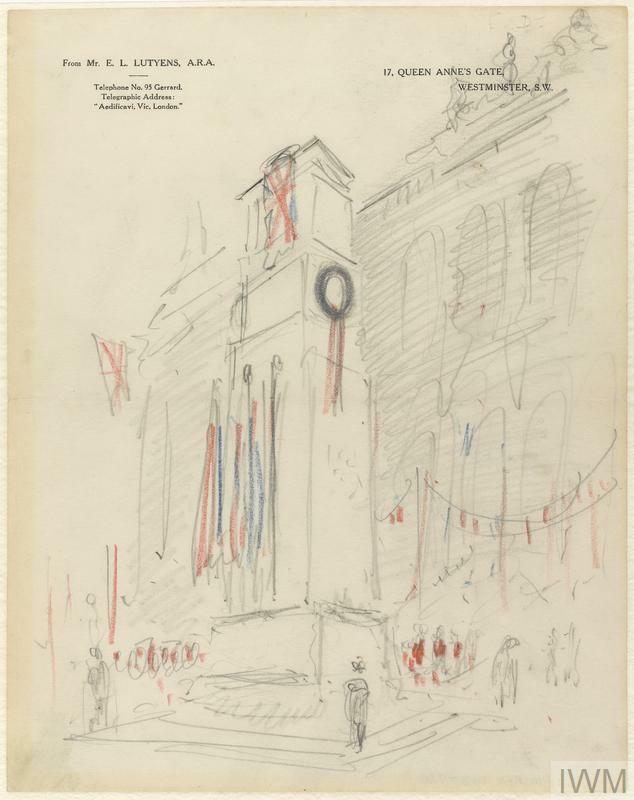 In the meantime a slightly revised design was accepted by the Cabinet for a permanent memorial, again sited in Whitehall and unveiled on Armistice Day, 1920. 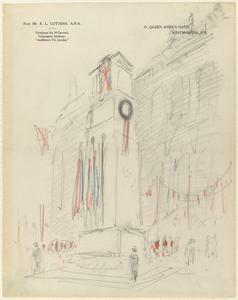 The Cenotaph remains the central focus of remembrance.